Dementia Australia SA provides a wide range of services to assist people living with dementia. Counsellors are available to provide advice, support and advocacy, on an individual basis or as a family group. We can provide this over the phone, as an office visit or at your home. The Dementia Advisors offer support, information and access to services for people living in the community with a diagnosis of dementia, their carers and family members. Nightingale Program is a palliative model of care, provided by specialist nurses, under the auspices of Dementia Australia, Adelaide, South Australia. It provides strategies and advice to support people living with dementia, their families and care providers with a focus on promoting choice and well-being during all stages of diagnosis. The program is funded by The Rosemary Foundation for Memory Support. Courses for carers are run regularly throughout the state and provide information and opportunities for discussion and support in a relaxed atmosphere. Ongoing Support Groups meet once a month in a number of suburban and regional locations. South Australia's Safe Return Program provides peace of mind for those who care for people who wander and may become confused. Services including Carer Education courses and printed information are continually being extended to meet the needs of ethnic and indigenous communities. We offer a range of Aboriginal and Torres Straight Islander Brain Hubs for social groups and councils, for more information about these services contact us on 8372 2100 or download our What Is Dementia brochure. A Brain Hub offers a flexible way to get information, education and advice on: brain health, memory changes, dementia risk reduction, understanding types of dementia and what supports and services are available. Contact us 8372 2100 or download our brochure. An extensive range of books, videos and activity aids related to dementia care is available to members. Click here for more information. Dementia Australia SA is the peak body representing the interests of people affected by dementia in South Australia. 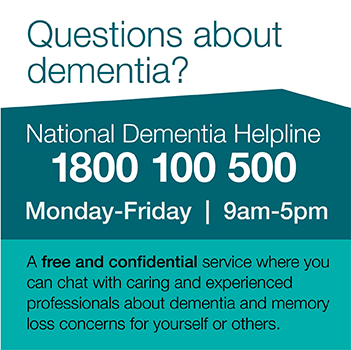 To find out more, contact us or call the National Dementia Helpline on 1800 100 500.